San Remo at Palmira is an outstanding Divosta homes community located in Bonita Springs, Florida. It is adjacent to Village Walk of Bonita Springs, its sister Divosta community. 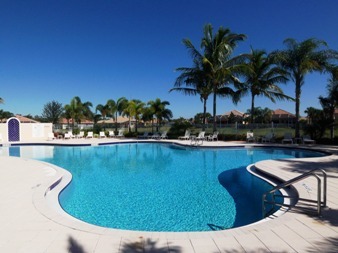 San Remo of Bonita springs is a gated community that hosts about 350 homes. The homes are Divosta built with quality features that include storm shutters, central vacuum and solid poured concrete walls. San Remo is sold out, however there are resales available. Hidden benefits of owning a home in San Remo include low fees and no CDD; community development district. The Village Center of San Remo offers a tropical, resort style pool, fitness center and serves entertainment meeting place for the community. Low fees and easy maintenance make this community a big hit with full time Bonita Springs residents and seasonal residents alike. Lawn service is included in the low maintenance fees. Never mow the yard again. Also included is monitored security and touch pad/speed pass entry. San Remo is located just east of I-75 on Bonita Beach Road. San Remo is located only 15-20 minutes to the Bonita Beach and Barefoot Beach. The new Southwest Florida International Airport is located approximately 25 minutes away just off of Ben Hill Griffin Parkway north of Miromar Outlet Mall and the International Design Center. The new Coconut Point Mall is located 20 minutes away. It offers world class dining, franchise and boutique shopping. Similar communities to San Remo include: Paloma, Sorrento, Hawthorne and Village Walk.